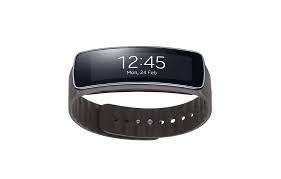 The Samsung Gear Fit has been announced, alongside the Gear 2 and the Gear Neo, at the Mobile World Conference in Barcelona. Samsung is diving headlong into the wearable fitness market and from what has been revealed, it seems lighter and more accessible to those who need to stay accessible while working out. Samsung thought “the smaller, the better” when it came to the Gear Fit and it seems pretty on track. The unit is half the size and weight of the Gear 2 and Gear Neo, making for a lightweight sport accessory. The screen features a curved Super AMOLED display as opposed to flat on the other models, making it more comfortable and unobtrusive against your skin. There should be no fear about dropping it in the toilet or breaking out in too big a sweat either, as the Gear Fit features the same water and dust proofing as the incoming Samsung Galaxy S5. One of the great things about having such a small device is the battery life. With typical usage Samsung predict the battery to last 3-4 days, sometimes up to 5 days with light use. When comparing it to the Neo and Gear 2, this is up by a full day of battery life. 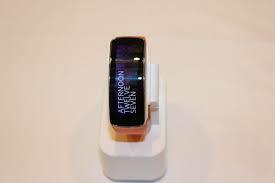 When you compare the features of the Gear 2 and Neo to the Fit, the Fit doesn’t have a camera or microphone and can’t send messages or emails. However, it does receive push notifications and has a media controller. 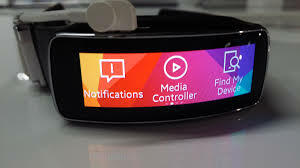 This could be a strength for the Gear Fit, meaning that it can bring down costs for the humble consumer whilst still making it useful to connect to your phone. The Gear Fit’s stand alone features are a pedometer, heart rate monitor, sleep monitor, stop watch and timer. The Gear Fit also has a real-time fitness coach to spur you on or get you to slow down depending on how hard you are exercising. It can also be synced up to Samsung S Health apps for Galaxy smartphones. 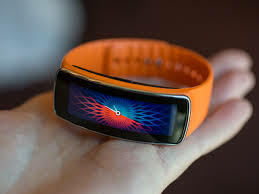 The Gear FIt seems to be one of the “healthiest” releases from Mobile World Conference 2014 and whether it will rise to the top of the wearable fitness pile will be based on Samsung’s price, which is to be announced April 11th.